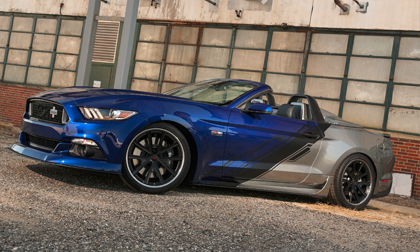 LAS VEGAS – October 29, 2015 – Classic Design Concepts (CDC) and SMC Productions LLC will unveil the 700 horsepower prototype for the limited edition Neiman Marcus 2016 Mustang convertible at the SEMA Show on Nov. 4 in Las Vegas at (booth #21257). This special line of Mustangs commemorates the car’s 50th Anniversary and is the first time Neiman Marcus has offered a fully customized muscle car to their customers. With just 100 examples being ever built, the limited-edition speedster is only available through Neiman Marcus and is featured in the iconic Christmas Catalog. Starting with the 2016 Mustang convertible, Classic Design Concepts & SMC Productions took on the challenge of turning America’s pony car into an exclusive performance machine with exotic styling cues. Uniquely different from any other Mustang on the road, upgrades include a new front end, rear deck lid spoiler and more. Firing up the engine with its four polished exhaust tips immediately brings the Mustang’s growl to life. With a custom calibrated 5.0L V8 engine featuring a Ford Racing supercharger system, the Neiman Marcus Mustang’s 700 horsepower creates a glorious symphony of combustion. To provide a more aggressive stance and lower center of gravity, Ford’s own track pack optional equipment group was incorporated into the build. Grip Equipped forged 3-pc wheels and sticky 255/35R/20 front & 305/30R/20 rear tires round out the package to help propel the Mustang down the road. Additional touches that help put this Mustang in a league of its own, include automotive bling like exclusive Neiman Marcus front and rear badging, Neiman Marcus lighted door sills, Neiman Marcus embroidered floor mats and headrests, as well as a serialized dash plaque to ensure collectability for generations to come. In addition, all Neiman Marcus Mustang owners will receive a Certificate of Authenticity identifying vehicle production number and vehicle identification number along with a voucher for the Ford Racing two-day Racing school experience. The custom Mustang embodies the refinement and attention to detail that is synonymous with the Neiman Marcus brand and has the legendary Ford performance to back it up. The Neiman Marcus Mustang is available for $95,000 and will be limited to just 100 examples. As an added bonus, Neiman Marcus will donate $1,000 to “The Heart of Neiman Marcus Foundation” with the purchase of this unique muscle car. The SEMA Show takes place November 3 – November 6, 2015 at the Las Vegas Convention Center. It is the premier automotive specialty products trade event in the world. It draws the industry’s brightest minds and more than 60,000 domestic and international buyers. For more information on the all-new limited edition Neiman Marcuse Mustang, please visit www.neimanmarcus.com/Mustang or call (888) 756-0775. Founded in 1990, Classic Design Concepts is an original designer and manufacturer of unique Original Equipment quality restyling products, supplying both the Original Equipment and aftermarket automotive industry. CDC prides itself on providing the enthusiast with cutting edge style and unsurpassed quality. For further information contact Classic Design Concepts, LLC., 28266 Beck Rd, Wixom, MI 48393, on the web at www.classicdesignconcepts.com or (248) 624-7997 or contact Scott Black at sblack@tprm.com or (214)520-3430 ext. 303.